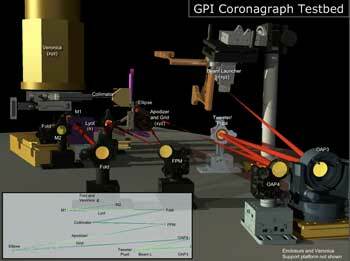 The adaptive optics (AO) subsystem is the heart of GPI. It is responsible for making fast visible-light measurements of the wave front external to GPI (primarily atmospheric phase errors) and correcting that wave front using its deformable mirrors. It is tightly integrated with other subsystems. The AO subsystem optical path begins at the entrance window. A steering mirror is available to align GPI’s pupils with the Gemini entrance pupil. The beam is then collimated and relayed to the first deformable mirror. This high-stroke low-actuator count piezo DM (referred to as the “woofer”) reduces the residual wave front error to a level controllable by the finer “tweeter” mirror. This DM will also serve as the tip/tilt mirror, mounted on a commercial FSM mount. The heart of the GPI adaptive optics system is a MEMS deformable mirror. 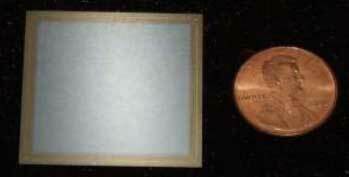 The image above shows an existing 64×64 element device that is slightly larger than a small coin. MEMS development was conducted at Boston Micromachines and funded by the CfAO and the LAO. A pair of optics relays the beam to the “tweeter” DM. This is a 4096-actuator MEMS device (with a 45-actuator-diameter region illuminated). Two more conic optics produce a converging F/64 beam with a finite pupil for input into the coronagraph path. A 0.95-micron dichroic splits the visible light into the fast spatially-filtered wave front sensor (SFWFS). The visible light passes through a variable-size spatial filter, used to remove uncontrollable spatial frequency components that would be aliased into incorrect wave front measurements. Relay optics then reform the pupil on a lenslet array, and the resulting dot pattern is in turn relayed to a high-speed CCD. The final CCD downselect has not been made (in part because of the developmental status of several attractive CCD options, but it will operate at 1-2 kHz with each subaperture corresponding to a 2×2 quad-cell. A bandpass or short-cutoff filter limits the wavelength range seen by the SFWFS (nominally to 0.7-0.9 microns), since spatial filter performance improves with increasing Strehl at the sensing wavelength, and since the spatial filter size can only be precisely matched to spatial frequency cutoff at a single wavelength. The baseline AO control algorithm is the Optimized-gain Fourier Controller (OFC) algorithm developed by Poyneer and Veran. This is an adaptive modal gain algorithm using the Fourier modes as its basis set, allowing both efficient reconstruction and a direct match to sensor geometry and the PSF. We have also explored a predictive controller algorithm. Although this is not yet the baseline, it has the potential to improve performance by a factor of 2 on dim stars, and/or allow performance at 1 kHz comparable to OFC performance at 2 kHz. We are specifying the AO control computer (AOC) with sufficient capability to support this predictive algorithm should we decide to implement it.